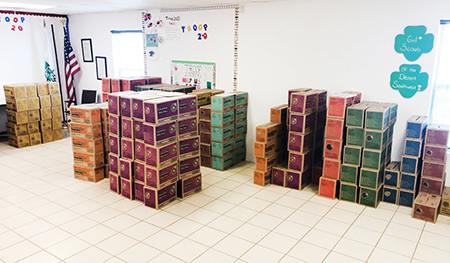 Girls Scouts of the Desert Southwest-Artesia received its fourth shipment of the “cookie season” this morning, and Girl Scouts are ready to begin supplying Artesia and surrounding areas with their famous treats. From shortbread cookies to Lemonades, the Scouts are offering eight different kinds of cookies this year, one for everyone’s unique taste. To purchase cookies, log onto www.gsdsw.org and click the “Find Cookies” link to see the places and times troops will be out in the community selling, or call 746-9846 to arrange for a home sales visit. Cookie sales end March 10; new shipments of cookies will be received each Tuesday between now and then. The Girl Scout Cookie Program encourages each girl to be herself. “When you buy a package, you empower a girl to be unique and embrace everything that makes her so special,” the website states.